Frogtech Geoscience is trusted by governments across the world to provide petroleum exploration solutions that lower investment barriers and unlock sovereign wealth. Working with departments and agencies at all levels, Frogtech delivers data, analysis and advice that helps governments across the globe attract investment and derive greater economic benefit from their national resources. Our open-license government solutions have been commissioned by agencies throughout the world and have contributed to billions of dollars in petroleum exploration investment. HOW DOES FROGTECH HELP GLOBAL GOVERNMENTS ATTRACT INVESTMENT? We mitigate investment risk by providing scientific evidence of economically-viable petroleum. Failure to organise geological datasets in an industry-standardised spatially-continuous model may inadvertently transfer unintended costs and risks back to potential bidders and inhibit wider investor appetite. Learn how Frogtech Geoscience helps governments avoid these risks in examples of our work below. 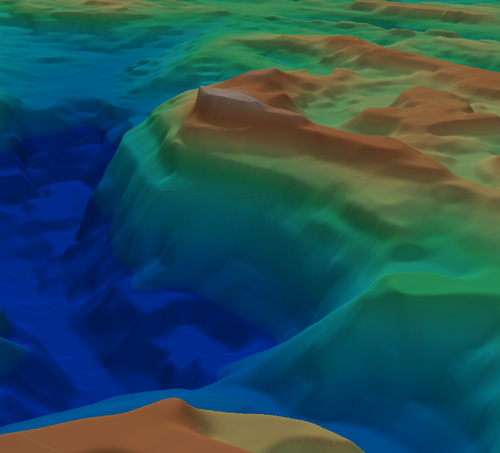 In 2017, Frogtech Geoscience was commission by the Government of Western Australia Department of Mines, Industry Regulation and Safety to produce a SEEBASE model of the Canning Basin, revising a past project completed in 2005, to produce markedly increased resolution of the Canning Basin Depth to Basement model compared with the 2005 project. "These new products form a valuable precompetitive dataset for both the minerals and petroleum industries." Western Australian Government Department of Mines, Industry Regulation and Safety. 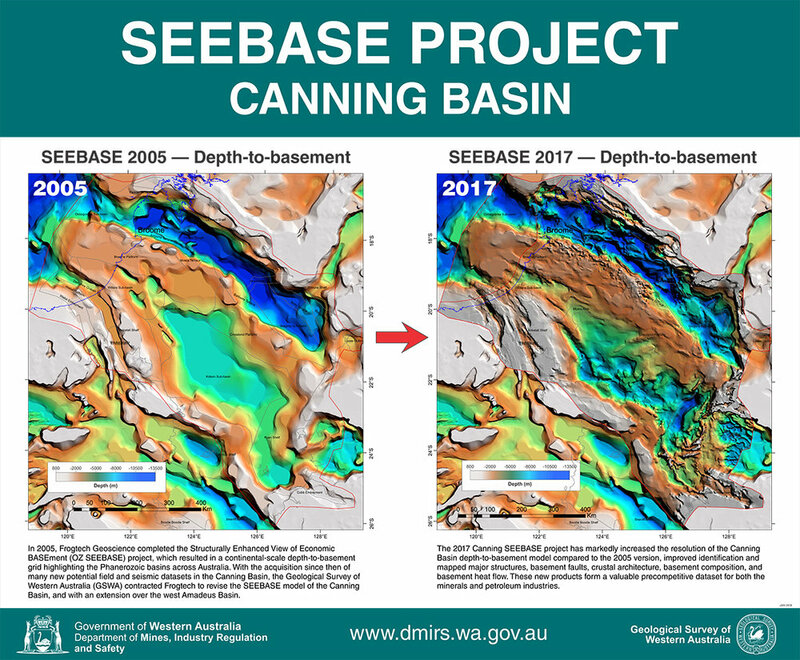 (Above) Poster publication of the Canning Basin SEEBASE Project, Government of Western Australia, Department of Mines, Industry Regulation and Safety. In 2016, Frogtech Geoscience was selected by the United Kingdom Oil and Gas Authority to produce an integrated geophysical and geological study of basement and basin evolution of the Greater East Shetland Platform and surrounds on the UK Continental Shelf (UKCS). The study was undertaken in support of the United Kingdom Oil and Gas Authority’s (UK OGA) 21st Century Exploration Road Map Initiative (21CXRM) to stimulate future exploration activity and support improvements in regional understanding of this area. (Above) UK Oil and Gas Authority UK Continental Shelf SEEBASE Study report excerpt. In 2017, Frogtech Geoscience was commissioned by the Northern Territory Government of Australia's Geollgical Survey to produce a SEEBASE Study and GIS of basement terranes, depth to basement (SEEBASE surface), depth to Moho, basement thickness and total sediment thickness and a comprehensive report outlining methods and major findings for the greater McArthur Basin. The greater McArthur Basin is a Palaeo to Mesoproterozoic basin that contains key stratigraphic intervals prospective for both petroleum and mineral resources. Numerous studies since the late 1990s have recognised stratigraphic correlations between the McArthur Basin, Birrindudu Basin and Tomkinson province, the outcropping and undercover extent of these contiguous regional correlatives are informally referred to as the greater McArthur Basin. Northern Territory Government Geological Survey Greater McArthur Basin SEEBASE STudy report excerpt.